How do I post a screen shot. I know someone showed me before, But I forget. I'll try and post a screen shot of the 98 Riv. generator/Alternator wiring diagram for comparison. thats the diagram for a 97 park avenue, i have a 97 park avenue. to screenshot on my laptop its the function key and insert. just look for the button at the top of the keyboard that says "prt sc" or something close to that. My point exactly, You have a 97 PA, we don't. Don't try to compare apples and oranges. I CAN"T FRIGGIN DO IT. Do you sense the frustration in my voice. I've been at this much too long. 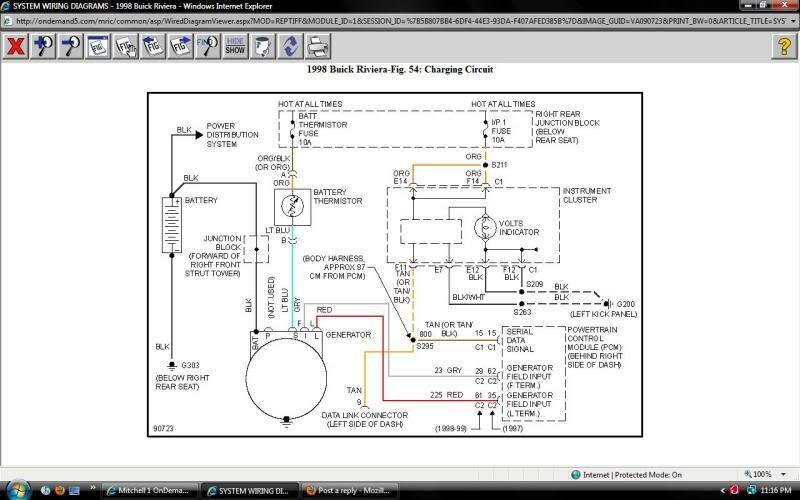 Please just look up the Wiring Diagram on Mitchell for the 1998 Riviera Charging System and screen shot it or what ever needs to be done. The diagram IS COMPLETELY DIFFERENT. Please post the Riv diagram, seeing as you know how to and i just spent the better part of an 45 min. trying and getting pissed over the process. I've calmed down now and looked at both wiring diagrams. Look at the foot note I added to one of your diagrams above. From what i can tell, the way your PA is wired, you cannot add the diode for increased output. Read above and compare wiring diagrams, you'll see what I mean. Please post the Mitchell diagram for a 98 riviera for comparison as it is representative of most if not all of the Riv's charging systems. You can then clearly see the difference and then we can discuss it. please bare with me as i am under the influence and maybe should not even be posting. im not sure what could be different because i have heard of regal/gtp guys doing this diode mod too, is my park ave different than the riv/regal/gtp? the only difference i see in the above pic is the light blue wire that goes to a thermistor, when i looked at the 98 gs diagram it didnt have a thermistor like my park ave. There is a mod I have heard about that involves adding the diode or resistor to the "S" terminal on your alternator. I don't know the details of it though. I think I heard BillBoost mention it. Maybe it is posted on the Bonneville sites. even though there isnt a wire going to the S terminal? The way i understand it is you have to add a "Sense" wire from the connector on the alternator to the Battery. I don't have the wiring diagram and don't know any more about it other than the alternator needs to sense a lower than optimal voltage to trigger the regulator to put out more voltage. This is what we are doing on the Riviera by tying into the Thermistor circuit. I have a 95 riviera and it only has two wires on the connector at the alt., one is red and the other is lt. blue. Does anyone know if I could still do this mod? If so I assume I'd still cut the lt. blue right? Any help would be greatly appreciated. Yes, the light blue wire, in theory, is the one to put a 1A diode in series with. The stripe should face the Alternator when you do this. I have this done on my '98, and it works great. That light blue wire goes to the S terminal of the Alternator, which is the same terminal used for the GP's and what-not......so, yes it will work. I have the diode from radio shack and I went to do it yesterday but I realised I have a 2 wire setup and everything I read on here reffered to 3 wires. Just wanted to make sure I cut the right wire. Guess I know what I'm doing tonight lol. Thanks Scott. I'll post results later. I installed the diod and now I see 14.2v via the aeroforce gauge. I wonder why I don't have 14.5v that AA gets? I didn't actually make a special note of the before voltage but I'm pretty sure is was 13.8-13.9. I wonder if I should upgrade the charge wire for the alternator. Production variances between alts is not uncommon, plus factor in every car ages differently and you can easily have such a small difference come up. Several years ago I had to order 3 powermaster alts in very short order, each was 70 amp at idle 100 amp max rated but since pwrmstr tests their alts before shipping I saw ratings between 68-73 amps idle and between 99 and 105 amps max. Plus your batt may be older or newer than AA's. Don't let me talk you out of upgrading your charge wire if that's what you want to do, my only point was every alt/batt/car is different. thats about what i see all the time with the diode mod, the highest i saw was like 14.6 on a cold start one morning. i havent upgraded the alternator charge wire yet either though so that might be a good idea, thats what i was thinking about doing when i only got 14.1/14.2 from this mod. I've got a steady 14.4V at idle. I'm lovin this new 150A Alternator too! Just added the diode and now getting 14.7 volts at idle. My battery is only about a year old which might be why I got a slightly higher reading using the same diode as everyone else. Ok the last few days its been around 10F outside and I've been seeing 15.1-15.2 volts. I peaked 15.3. That's a bit more than I want. Anyone else? This is a function of the thermistor at the battery - it's allowing more volts because the battery is very cold. It's supposed to do this, because you want to charge a cold battery with more voltage than a warm one. As the battery begins to warm from charging, the thermistor will command less voltage from the alternator, and you should notice a drop back to 14-15 volts. In effect, the voltage booster mod is actually fooling the alternator into thinking the battery is slightly cooler than it actually is, resulting in an extra volt or so being delivered. PS - when I replaced my OEM battery with Optima RedTop, I removed the voltage booster mod and found the alternator was producing 14+ volts without it, so I did not reinstall. Yes, If I warm the car up and drive longer than 10 minutes to work voltage settles down a little. Is 15.2 or so ok though? How much voltage is too much for the car? Tough question. For charging the battery, you're fine. For the car's electronics, it's obvious that some unregulated items (fans, lamps, relays) will wear out more quickly, but how much who knows. The computer modules I believe are regulated internally, so don't think it would cause a problem. I know the car will operate and survive much higher voltage, at least temporarily. When my alternator/regulator died earlier this year, I was seeing 17+ volts. It threw a system voltage DTC, SES light, and caused the car to do some funny things, but after a new alternator all was back to normal with no damage that I am aware. I ran the voltage boost mod for a few years, and like you I measured over 15 volts cold many times. Are you saying that after the car warms up and the battery has been top charged by the alternator, after the drain to start the car, you are still seeing 15 plus volts.? To reiterate, you are seeing 15+ volts on your voltmeter during normal operation.? You possibly have a voltage regulator going bad, A diode in the diode bridge bad, or bad connections at any one of the battery + cables and or grounds. Obviously the first place to pay some attention to is the cable connections. Start from the battery and work forward to the underhood connection on the right fender and then to the alternator to make sure all connections are clean and tight. Clean with wire brush or sandpaper and consider using some star washers to help make a better connection at all connection points. Look closely at the cables for any corrosion, not only at the terminal ends but to see if corrosion is working its way up the strands of a cable, typically green color. There are ground connections that are just as important as the positive cables. There are some on the passenger side frame rail accessible from under the car or from under the hood on some years. And, of course the connections under the rear seat to the chassis. Even if they look good to the eye, you want to remove the bolts holding them down and clean them and put new star washers on them to help them bite a new connection. That is the cheapest way to start rather than replacing parts. Since you have a voltmeter in the cockpit you can keep an eye on the voltage over time and if you see it slowly creeping up you'll know you have a regulator problem. One other over looked item is the Thermistor itself, check the resistance of it and replace if necessary. I don't remember the proper resistance measurement but it is in the manual. Good luck, you certainly want to keep the voltage below 15.5v after warm up. I would already be looking for issues at 15.5 as you are, during normal operating conditions. Below 15 volts is a more normal reading. I currently get 14.2 to 14.5 volts after warm up and cruising on the highway. This is after having increased the diameter of the cable coming from the alternator to the underhood charging connector. From the factory that cable is too small. So I made up a #6 cable that I have piggybacked the original from the alternator to the connector on the right fender. If you look at the diameter of the cable at the fender and going back to the battery you will see it is quite substantial in diameter. The choke point was the size of the cable from the alternator to that connector. So about 3 or 4 feet of heavier cable brought my voltage reading at the battery up to 14.2 to 14.5v, which was much better than the 12.8 to 13 volts I was reading. More driving - If I drive for an extended period or time where I suppose the battery fully heats up, it gets down to about 14.5volts with the booster diode in place. That's good - about .7 more than it would be without it. I'm pretty good with it now seeing as it does get down to the voltage I want once it's thoroughly warmed up. I like the idea of upgrading that alternator cable but it's probably going to wait until summer. I have a lot of fish on the fryer right now that need a fryin.